A radar image of the moon's south lunar pole, which shows dark crater regions never illuminated by the sun. Some scientists think water ice or hydrogen deposits may exists in such areas. The moon fascinates us. The only world other than Earth upon which humans have set foot, we know a remarkable amount about it, yet countless mysteries remain. One theory, presented at Europlanet's latest Planetary Science Congress by Joop Houtkooper from the University of Giessen, suggests that conditions in some lunar craters may be perfect for preserving samples of life from Earth and maybe even Mars. The moon rotates at such an angle that the sun is directly above its equator. Some craters near the lunar poles therefore exist in eternal darkness, never seeing the sun's light. Houtkooper says the Shackleton crater (which is 19 kilometers in diameter) at the south pole of the moon may contain such shadowed spots. "[Shackleton's] deep center is pitch black, except from some reflected sunlight from the crater edges," says Houtkooper. 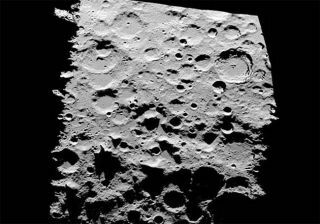 "But on the bottom of Shackleton there are no doubt other, smaller craters. In these there are spots where not even reflected sunlight reaches. So from these places we look straight into the cold universe." Just how cold? These dark spots are 25 degrees Kelvin (-248.16 degrees C), an excellent temperature for preservation. In fact, gases in these locations freeze and form ices. Houtkooper argues that this material in the craters is churned up by meteorite impacts -- rare occurrences, but over billions of years quite likely – and anything present within the meteorites would be covered and protected against erosion by the solar wind. Finding ancient meteorites on the moon would be exciting enough, but what they may contain really interests Houtkooper. Consider simple bacterial life on the early Earth, existing inside a rock which is then blasted off the surface of the planet by a large impact. In theory, some of these samples could have landed in lunar craters like Shackleton. Once there, they would be perfectly preserved in a deep freeze for billions of years. Life carried to the moon in this way would almost certainly be dead, although it is possible that some hardy creatures could survive the journey in a dormant state. As Houtkooper succinctly states, "there could be signs of life from early Earth on the moon." Things get particularly interesting when a large impact on the moon by an object around 10 km in diameter is considered. If that were to occur, enough material would be thrown up to create a very thin lunar atmosphere. This tenuous atmosphere could last a few hundred years, just enough time to spark into action any dormant life that had been carried to the moon from other worlds. So it is possible that, dotted throughout the moon's colorful history, it may have hosted simple but live alien organisms. Houtkooper claims that there is no reason why the transportation and preservation of microbes is limited to the Earth-moon system. If there was life on Mars, the same process could have occurred. Pristine martian samples may well be awaiting discovery in the deep, dark depths of a lunar crater. If ancient life were discovered on the moon, we could determine their world of origin. Organisms feature isotopic signatures, which are like biological passports that indicate their place of birth. If the preserved life originated on our own planet, we could determine this with good accuracy. The same can be said for Mars, as the many years of scientific missions to the red planet have furnished us with detailed information about conditions over its history. If the isotopic signature could not be determined, one exciting possibility is that the organisms may herald from other, even more exotic worlds. Finding Earth-life on the moon could give us new information about ancient life on our planet, and finding extraterrestrial microbes would be a triumph for science. But just how likely is it that preserved creatures exist at the bottom of moon craters? "It is a small chance," Houtkooper admits. "But it is still a chance." Houtkooper says that because ice is a useful material for human investigation of the moon, our future exploration efforts will center on those cold spots anyway. "There could be a huge bonus scientifically if we look at what the ice contains," he notes. Some microbes on Earth have been found frozen for thousands of years which have subsequently been thawed and resurrected. If microbes are discovered at the bottom of craters like Shackleton, there is an exciting possibility that warming them up and exposing them to liquid water may provide the wake-up call that they are waiting for. All these possibilities remain unproven theories until evidence is provided. Fortunately, with manned missions to the moon planned, and ice being a logical target, it is likely that tests will be carried out. As Houtkooper concludes, "It's a long shot, but if we are going there anyway then why not take it on the side?"